Explore the art of the Philippines at this fiesta Filipina! Presented by The Consuelo Foundation. Museum members: Admission is free for museum members. You do not need a ticket. For a speedy entry, use your digital member card in the HoMA mobile app—or check in at the event through the members' line. Non-members: General admission is $25. You can purchase tickets at the event, or online using the button below. Or for just $5 more you can join or renew a membership to get into ARTafterDARK for free all year. • Get your dance on when DJ Anit spins in the Luce Courtyard! • The Filipino Association of University Women brings interactive activities to teach ARTafterDARKers about the Philippines, including a Flor de Mayo arch for guests to take pictures under! • The Tekniqlingz take the stage in Central Courtyard to show off modern Filipino moves—stick around after the performance and they'll teach you some dances. • Karaoke, a Filipino favorite, will be available for guests to sing their puso out! • Wayland and Desiree Quintero from ILI Dances will perform two Philippine modern folk dances and a traditional dance to the sound of gong music. Food provided by EAT Honolulu. Specialty drink: the Skinny Colada: A modern twist on an old favorite. Bacardi Rum, pineapple juice and coconut water. Drinks by Free Spirits Mobile Bartenders. 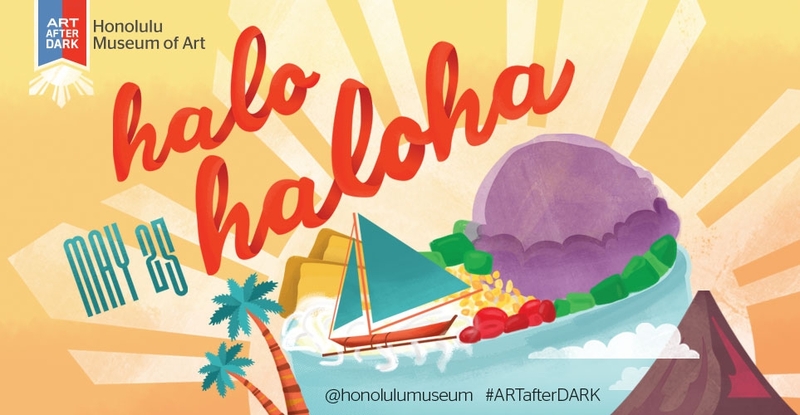 A reminder that although ARTafterDARK doesn't have an age restriction, the event is loud, crowded, and there is no specific programming for children. Children should be supervised at all times.